In clinical neuropsychiatry, case studies provide invaluable demonstrations of the range and types of unusual psychological states that can occur after brain damage. In the pursuit of objectivity and scientific respectability, however, many academic reports of neuropsychiatric disorders appear cold, contrived and impersonal. The essence and character of the patient's experience and behaviour is easily obscured or even lost - a fact that cannot help researchers, therapists and other practitioners to relate their conceptual knowledge to the flesh-and-blood people they meet in their professional lives. In practice, much of the actual discourse of such patients has been ignored as unworthy of scientific interest. This book describes real patients in a clear and jargon-free way. These cases should serve to reduce the discrepancy between the formal representations of psychiatric illness in the mainstream literature and the reality of people struggling to make sense of their own predicament in everyday life. Section A: Introduction. J.C. Marshall, P.W. 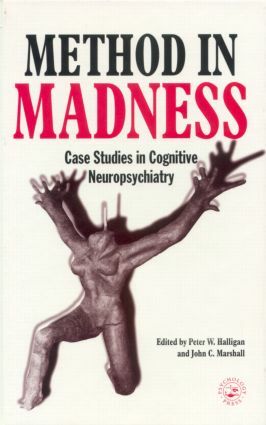 Halligan, Towards a Cognitive Neuropsychiatry. E. Weinstein, Reduplicative Misidentification Syndromes. Section B: Who Are You? H.D. Ellis, T.K. Szulecka, The Disguised Lover: A Case of Frégoli Delusion. P.W. Burgess, D. Baxter, M. Rose, N. Alderman, Delusional Paramnesic Misidentification. H.D. Ellis, K.M. Leafhead, Raymond: A Study of an Adult with Asperger Syndrome. Section C: Who am I? A.P. McKay, P.J. McKenna, K. Laws, Severe Schizophrenia: What is it Like? A. David, R. Kemp, L. Smith, T. Fahy, Split Minds: Multiple Personality and Schizophrenia. A.W. Young, K.M. Leafhead, Betwixt Life and Death: Case Studies of the Cotard Delusion. A.J. Parkin, The Alien Hand. Section D: Where Was I? C. Luzzatti, R. Verga, Reduplicative Paramnesia for Places with Preserved Memory. S.D. Sala, R. Freschi, F. Lucchelli, S. Muggia, H. Spinnler, Retrograde Amnesia: No Past, New Life. Section E: What Do I Believe? P.W. Halligan, J.C. Marshall, The Wise Prophet Makes Sure of the Event First: Hallucinations, Amnesia and Delusions. C. Cahill, C. Frith, False Perceptions or False Beliefs? Hallucinations and Delusions in Schizophrenia.